Qualcomm has launched a new processor targeting makers of AR & VR headsets. Rather than use a smartphone chipset, Qualcomm reckons that a processor specifically designed for AR & VR will be compelling for device makers - and end users. It claims that the Qualcomm Snapdragon XR1 Platform is the first dedicated processor for Extended Reality (XR), and it already has backing from device makers such as Meta, Vive, Vuzix and Picoare. 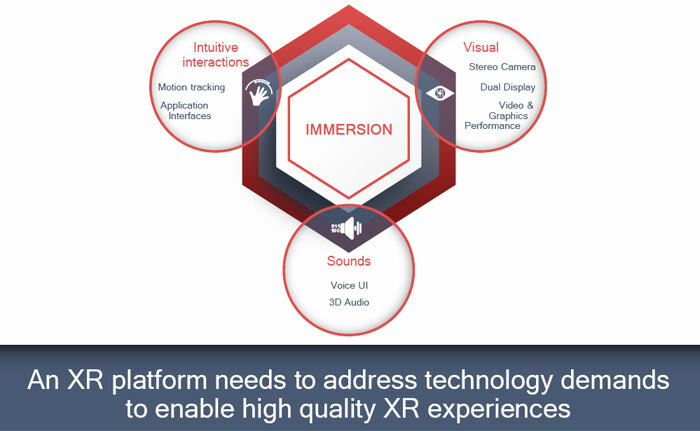 Qualcomm thinks the budding XR market has plenty of room to grow, with an estimated 186 million standalone AR and VR base by 2023, and its specialist processor will benefit as XR experiences go mainstream. In the video above, Qualcomm shows the types of experiences that it hopes the new XR1 processor will help enable. There doesn't appear to be anything new here, just various untethered VR headsets and AR glasses. Its press-kit reveals broader ambitions, as it mentions healthcare, education, military, engineering, emergency response and more. Hopefully this dedicated processor can help enable good battery life, and more accessible pricing too. 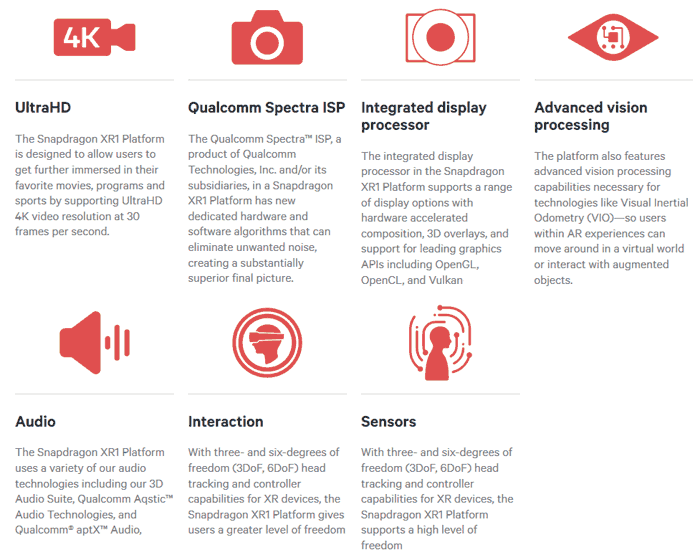 The key components of the new Qualcomm Snapdragon XR1 don't sound a lot different to those in a modern smartphone processor. However there is of course room for tweaks and emphasis on specific processing of 3D XR tasks rather than telephony, for example. The main components of the Snapdragon XR1 processor are shown in the diagram above. These broadly address audio/visual processing, user interaction, and AI tasks. Inside this SoC you will find that there are some familiar Qualcomm technologies such as the Kryo CPU, Adreno GPU, and Hexagon Vector Processor are present. These can adeptly process rich visuals and audio, as we already know. Meanwhile, new essential components for the XR1 Platform include; AI and machine learning frameworks for object classification, pose prediction, natural language understanding and speaker recognition. Additionally Qualcomm has packed in DSP Sensor Fusion for minimal latency and precise head tracking, enabling support for 3DoF as well as 6DoF controllers.